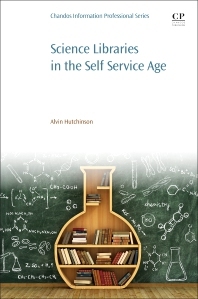 Science Libraries in the Self Service Age: Developing New Services, Targeting New Users suggests ways in which libraries can remain relevant to their institution. This book describes the myriad of new services and user communities which science librarians have recently incorporated into their routines. Where applicable, the book focuses on both researcher needs and the simple economics that emphasize the need for new service development. Science librarians will have to adapt to changing behaviors and needs if they want to remain a part of their organization’s future. As this trend has hastened science librarians to develop new services, many of them aimed at audiences or user groups which had not typically used the library, this book provides timely tactics on which to build a cohesive plan. Alvin Hutchinson is Digital Services Librarian at the Smithsonian Libraries, USA. Previously, he has worked as a subject specialist at the Smithsonian’s National Museum of Natural History and at the National Zoological Park. He has written for the online journal, Issues in Science and Technology Libraries and his chapter on showcasing Smithsonian research was included in, How to STEM: Science, Technology, Engineering, and Math Education in Libraries. He currently manages a repository containing scholarly electronic reprints reflecting Smithsonian research and works on several other digital projects at the Smithsonian Libraries.